Individuals who highly skilled managers using a broad range of industry skills combined with specialised managerial skills and substantial knowledge of industry to coordinate travel and tourism operations. Individuals who would like to learn to operate with autonomy and are be responsible for making strategic business management decisions. 78 weeks. Full-time, 20 hours per week. At the successful completion of this course the participant will receive an Diploma of Travel and Tourism Management SIT50116. Those students who do not complete this course or who are deemed not yet competent in units will still receive a Statement of Attainment for all units completed. Attainment of this qualification may enable the participant to fill positions in inbound groups/sales manager, incentives manager, tour operations manager, marketing manager, product development manager, reservations manager, travel agency manager, sales manager or visitor information centre manager. 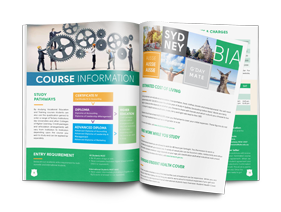 After achieving this qualification candidates may choose to progress into an Advanced Diploma program with the Business Institute of Australia. This qualification is made up of 23 units of competency (12 core units and 11 elective units).